HomeMobile PhonesHow to Factory reset a china android phone with chinese recovery menu. A sage has to know How you can Factory reset a china android phone with Chinese recovery menu. Its for this purpose that this article will come in handy for all the sages. With the current increase in demand for android phones, it is a fact that countries in the English-speaking nations have opted to import android phones from China to satisfy the growing demand. It therefore adds that the imported phones have Chinese as their default language and therefore the recovery menu is also in Chinese. We are often forced by circumstances to factory reset our android phones because it is not booting anymore or you just to try to make them function as expected. It is undeniable that most of us have problems maneuvering around the recovery menu of the Chinese android phone because we literally don’t understand a thing. If you are reading this, then definitely you are looking for a solution to the problem and I will show you what each of the items in the Chinese recovery menu really means and what it does. Once in the recovery menu, you will see several lines in Chinese. You can switch between the lines by pressing the ‘volume down’ key to move down the menu and the ‘volume up’ key to move up the menu. You can use the power button or the home button to enter any of those options. The menu may defer depending on the model of phone. The meaning of each of the items in the chinese recovery menu is illustrated in the diagram below. 1. Manual Test; this option is used to test whether the selected aspect of the phone is working perfectly. 2. Individual test; this one narrows the test to individual items such as the LED lights. 3. Test results; this option gives the overall test results of the functionality of the phone. 4. Debug test options; Tests the debug functionality of the phone. it. eMMC basically means internal memory. time, IMEI number, just to mention a few. 7. Reboot; U can use this option to reboot the phone. 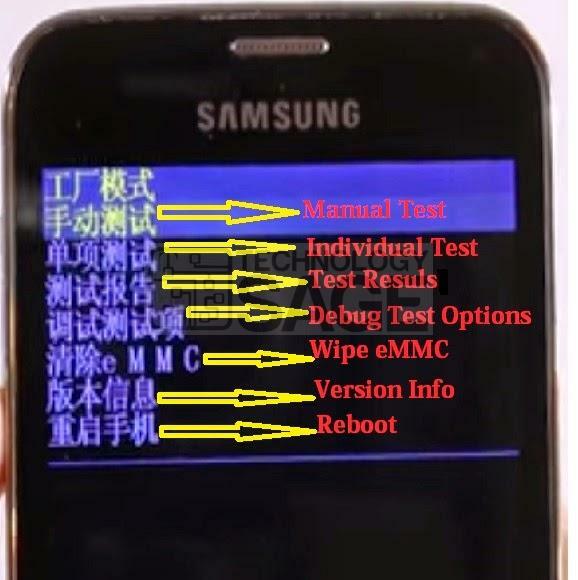 If you ever wish to factory reset your phone and you get a chinese recovery menu, use the ‘Wipe eMMC‘ option. I believe this article has answered these various questions such as how to factory reset tecno m3, tecno c5, tecno c8 how to factory reset tecno m5 and how to factory reset tecno p5 because they all have their recovery menu in Chinese. I believe you are now equipped with the knowledge on How to Factory reset a china android phone with chinese recovery menu, read on for more educative tricks and info on this blog. thanks for the info, but is there a way i can re open my phone, without wiping out everything if i forget my password? bonjour, j’ai essayé le WIPE eCCM mais mon téléphone SCOTT SKILL Smartphone 4 – ANDROID 4.4.2. me remets systématiquement sur le Menu de récupération en chinois. Hi everyone, it’s lass from the Democratic Republic of Congo. Do this for phones with the recovery mode in Chinese: high volume + home button + power button. Hold these buttons until you sort this message (No command) on the screen of your stelephone. Then release all buttons and press once the power button, you will see the recovery mode appear in English and you know what to do. Thanks for this but i want to know if the factory reset can be used to solve some phones problems like say the touch screen isnt responding very well. My phone keep coming on the recovery menu everytime i try to reboot it.